So, Helen -- what did you think about this movie? [To our readers -- Helen and I both like experimenting with photography, and recently we came across an article online called "40 Movies About Photography Every Photographer Should See." We decided to watch the same movie within a short time period and compare our reactions. The movie tells the story of how a young man. John Maloof, bought a box full of negatives at an auction, and was so intrigued by the photographs that he begins searching into the life of the woman who took them. He buys up more of her negatives, and finds (and buys) her storage unit stuffed full with boxes. 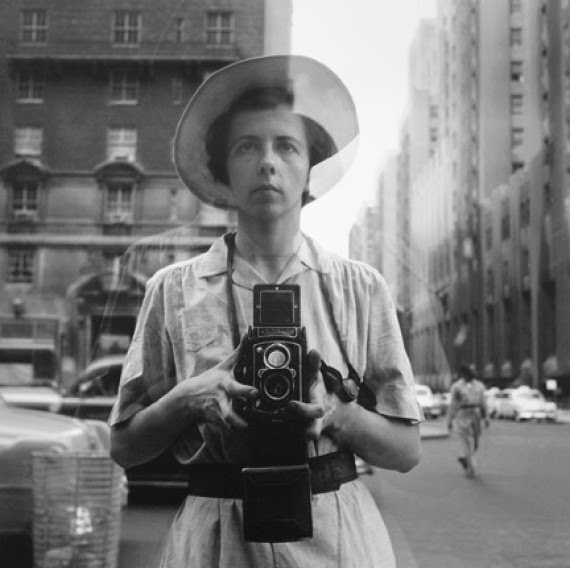 She was Vivian Maier, a New York-born nanny and housekeeper who carried her Rollieiflex camera with her everywhere, taking photos with a truly remarkable eye. So the story unfolds -- of an unassuming woman, her amazing photographs, the effect she had on the people around her. I thought it was absolutely fascinating. The photographs were mesmerizing. I've never been drawn to taking street portraits, but gosh, I was really struck by how strong hers were. She captured strength and frailty and love and pathos and all sorts of emotions. I was also struck by that aspect of art that always draws me in -- turning the most mundane moments of life into art. It's a special sort of eye to do that, I think. Were you as intrigued by the mystery aspect of the story as I was? Finding out who she was -- and I loved hearing about how Maloof was so intrigued by so many photographs that were obviously from the same European village that he hunted and hunted and compared photographs until he found which village it was. I found the descriptions of her from the families she worked for and lived with interesting too -- but mainly interesting in how different their views were of her. It made me wonder whether she was different in each setting, or if they had her at different times in her life, or whether it reflected more about the people who described her than it did about her. Mostly though, I came away feeling that it's important to just take pictures, and keep taking pictures. In part to develop one's eye, but maybe more importantly to make onself see what's there... to see the art that's in front of us all the time. I'm thinking one could learn a lot from studying her photographs. Oh -- the film mentioned how Maloof posted the first photos of hers that he developed on Flickr -- and I've just gone to look. There are a lot of her photos there. Oh -- another thing I loved -- how Maloof laid out various collections on the floor and shot them from above -- her boxes. Her paper ephemera. Her buttons and doodads. I'm always drawn to seeing collections of things laid out so graphically like that. I'll be interested to hear what you think. Did it make you want to get out and take photos? And now it's your turn to pick!